It’s snowing again so that means “no grilling” outside. 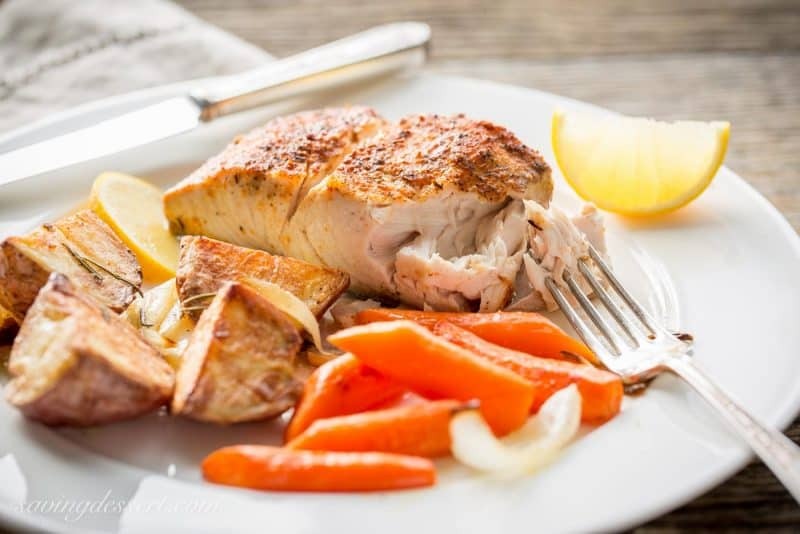 We love fish on the grill but when forced inside due to weather (and it’s too darn cold) baking fish is our go-to method for tender, flaky, moist and delicious fish that’s good for you too! For this recipe we used wild-caught mahi mahi but you can use any firm-fleshed fish such as grouper, striped bass, or red snapper. Just be sure to adjust cooking times depending on the thickness of your fillets. Baked Fish & Vegetables is a simple one-pan meal that can be ready to put on the table in about an hour. 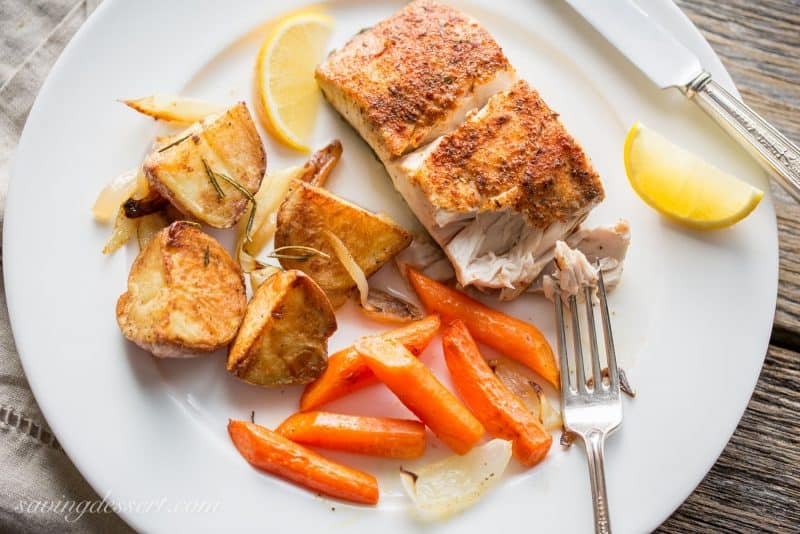 We used quartered red potatoes, carrots and onions and baked the fish on slices of fresh lemon. Rosemary and garlic rounded out the flavors of the roasted potatoes and we used a blackened seasoning for the fish. You can use whatever seasoning you like on the fish, but since mahi mahi is very mild, we always like to go bold. Six to eight ounces of fish per person seems to be about right, with a couple of carrots and one potato, quartered. If you’re planning for a group or large family be sure to use a large sheet pan so each of the vegetables can roast to crispy perfection! If you haven’t tried mahi mahi I highly recommend you give it a chance. It has a marvelous texture, mild flavor and it holds together well when grilled or baked. It’s relatively inexpensive when compared to other wild-caught varieties. 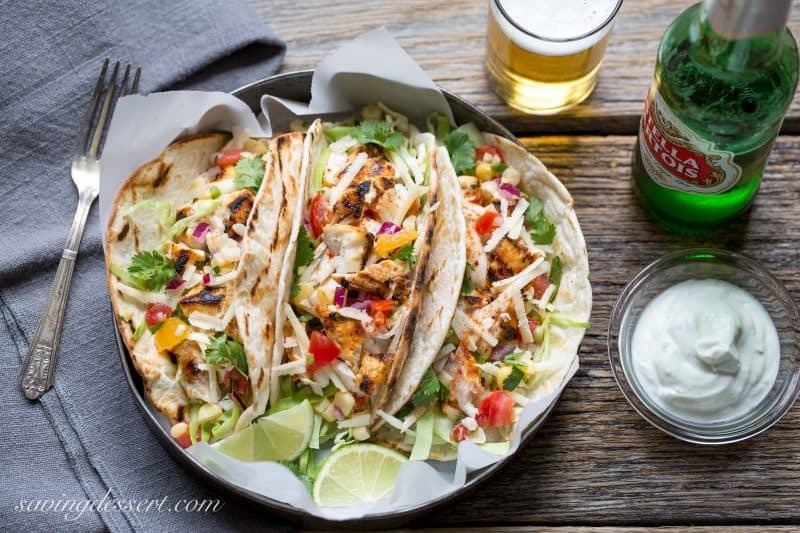 When you dig your grill out of the snow this spring, you’ll want to try these wonderful Sriracha Grilled Mahi Mahi Fish Tacos. 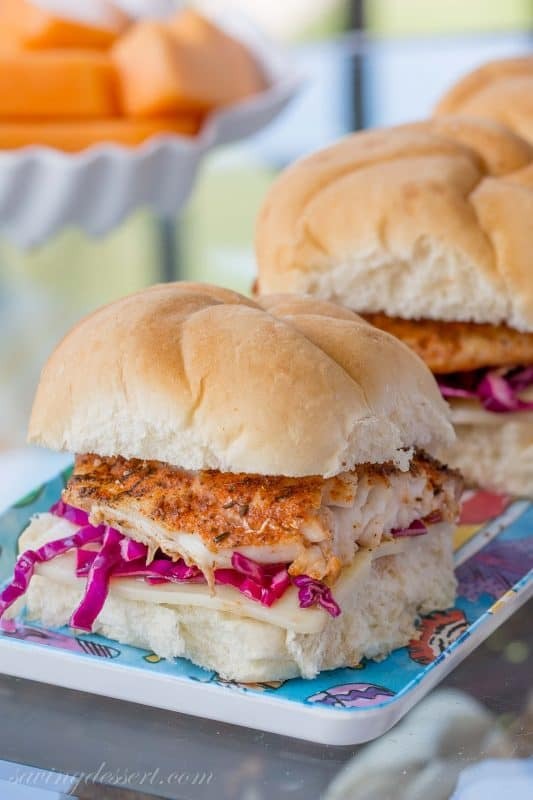 Don’t forget about this Grilled Blackened Grouper Sandwich for a simple and delicious meal anytime. 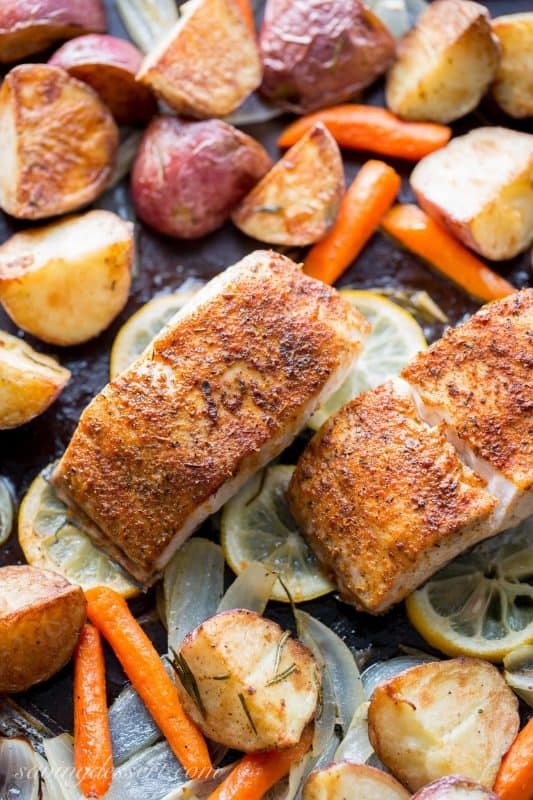 A complete one-pan dinner with healthy, flavorful fish, perfectly cooked with your choice vegetables. 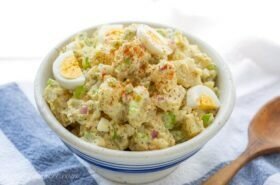 Easy to make and easy to clean up making this a great weeknight meal. 2 pounds Mahi Mahi or other firm-fleshed fish, rinsed in cold water and dried with paper towels. Spread the potatoes in a single layer on a large baking sheet. Season with salt and pepper. Bake the potatoes for 15 minutes, then remove from the oven and turn the potatoes. Bake another 15 minutes and turn again, move the potatoes to one side of the pan. Add the carrots and onion to the mixing bowl and toss to coat in any remaining olive oil. Add 1 teaspoon of oil if needed to cover the vegetables. Sprinkle with salt and pepper. Add the carrots and onion to the baking sheet and return to the oven for 15 minutes. Remove the vegetables from the oven and make a hole in the center. Gently toss the fish fillets in the mixing bowl, adding more olive oil if needed to coat. Place the lemon in a single layer in the center of the baking pan and put the fish on top, skin side down. Sprinkle with the blackened seasoning and bake for 15-20 minutes or until the fish flakes easily and is just cooked through. Allow the dish to rest for 5 minutes before serving. Happy President’s Day! They’ve forecast 10 inches of snow for the day, and we seem to have at least 6 inches on the ground already. The groundhog was wrong once again … it doesn’t look like an early spring to me! Have a wonderful week and thanks so much for stopping by! What a wonderful meal! I haven’t had Mahi-Mahi is such a long time and don’t remember what it tastes like. Time to try it again using your method. Mahi Mahi is so mild and meaty, but in a good way. It soaks up the flavors and cooks easily without falling apart. One of my favorites! The 4″-5″ of snow we had this morning (canceling schools and making rush hour a nightmare) is rapidly turning to slush and mud. Snow boots? Mud boots? I can’t keep track! I find that dreary weather gives me a taste for fresh and simple food. 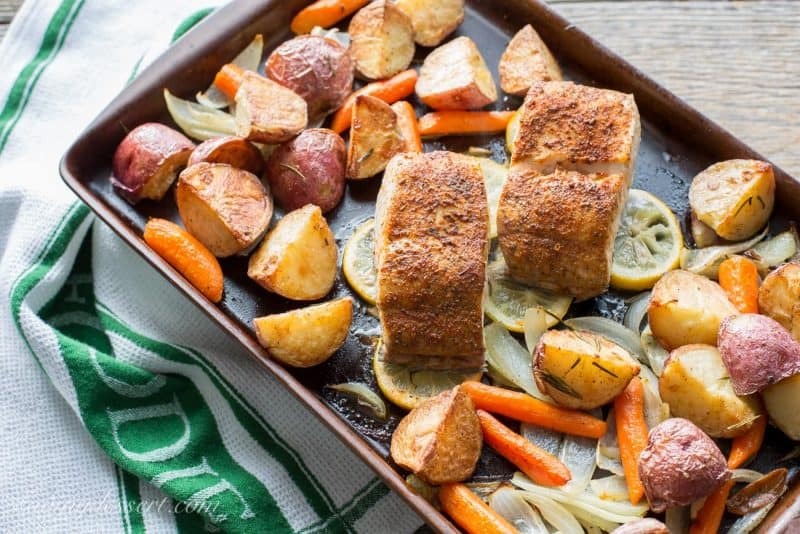 This baked fish and veggies is just the kind of dinner I am craving! Thanks. Fish is hands down my favorite food on the face of the planet. I would say I am a pescatarian….. Until I eat chicken? LOL!! Oh and I guess I am so not because I totally ate red meat yesterday! LOL! But still, FISH IS TOPS! I have missed so many wonderful posts Tricia. Welcome back Mandy! So glad you are feeling better. Miss your wonderful posts! This is such a pretty dish, Tricia. We eat roasted vegetables at least 3 times a week in the winter months and baking fish is a great option instead of shoveling your way to the grill! I haven’t had mahi mahi in ages so thanks for the reminder. I sort of get stuck on salmon because we love it so much but it’s such a nice light fish in contrast to salmon. Your blog is the kind of place where I want to pour a glass of wine and browse all evening through your beautiful creativity! I love these one pan meals. They are quick to put together and incredibly tasty-perfect for weeknight cooking and for company. Thanks Adria – I love them too! Have a great week. It was even good left over Muna – thanks for stopping by! Thanks Greg – have a great weekend! I sure wish this was on my dinner table, it looks delicious. The weather is playing tricks on all of us, it’s been in the high 80’s all week here, but I’m sure it’ll cool off soon. Enjoy the snow, it really is so pretty! This is so easy Diane – and I’m jealous of your 80 degrees. We’re going up to the mid-60’s this weekend, then snow again next week. Such a roller coaster! Have a great weekend! It’s been way too long since we’ve grilled! But that’s OK — the oven is a pretty good substitute. This is a wonderful looking dish — tons of eye appeal, and so flavorful. Really good — thannks. I seriously like this baked fished dinner (and the other two fish dishes just as much). I’ve never seen a mahi mahi sold around here but I’m definitely giving this recipe a try. 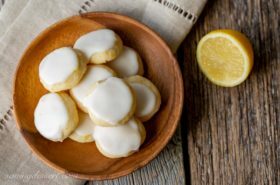 Thanks Amalia – I think you will love it – so easy and delicious. Have a great week! I love simple dishes like this and the whole collection looks superb! Hope you don’t get too much snow, but these dishes would have me at least thinking spring! Simple fresh ingredients always wins in our house! We ended up with 6 inches of snow and another 1/4 inch of ice on top. But it’s going up to 65 degrees on Saturday – ready for spring here too! Hi Tricia, what a wonderful meal you have created, love fish prepared anyway. Your fish looks perfectly cooked. Love roasted veggies!!! wow! 10 inches seems like quite alot, last night on the news they showed 3 brothers that live in Minn (I think) and they made incredible ice sculptures out of snow…….. Thanks Cheri! We only ended up with 6 inches of snow and some ice on top of that. But the sun is out this afternoon and they have forecast 65 degrees for Saturday. So we may have to bust out the grill and char some fish or something. Can’t wait for spring! I love an easy dinner like this! 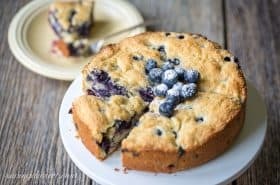 How great to be able to make it in one pan too! You inspire me with your crockpot recipes Chris – I love anything that can cook in one pot. Soups, stews and fish and vegetables – weeknight easy is perfect anytime! 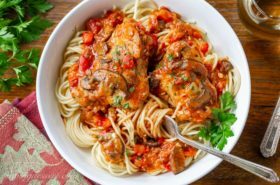 Thanks Jennifer – I love these easy one pan meals. This was particularly tasty with the mahi mahi. Yummy! Tricia, this is my kind of meal. I love roasted veggies , parsnip and sweet potatoes being my favorite. I always put the fish in a separate pan but l like your idea of putting everything in one pan. Your fish tacos look fantastic . Have a great week. I am a root vegetable girl too Gerlinde – hope you will give this a try! I bet you did enjoy some tasty fish in Florida – welcome home – hope the flight got much better once you passed all the weather. 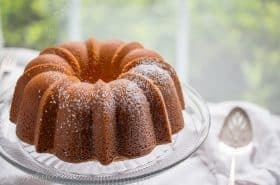 What a fantastic and super easy recipe. The tacos and sandwich look amazing too! I hope spring arrives soon for you. Me too Nancy – thanks for stopping by! Tricia – it’s snowing here now as well (the fellas are watching a movie on this day off)…we’re only supposed to get 1-3 inches (let’s see about that!) and then it turns to rain and temps in the 50’s. What an odd winter! I need bright healthy meals like your fish bake here (along with dark chocolate, of course…) to see me through the winter. This looks so delicious, perfectly cooked. We love mahi mahi but don’t get to eat it nearly enough. I will put fish on my grocery list! Thanks Monica – hope the snow didn’t last long. It is raining like crazy here today. I love a food piece of fish! Have a lovely week. The fish looks so meaty and delicious! This is my kind of food, Tricia. Thanks Angie – me too!